Late spring and early summer typically mark the beginning of the busiest home-selling and home-buying season. The flowers are in bloom and daylight savings offers buyers more time to look at houses. With warmer weather and the motivation to get a new house in order before school begins in the fall, buyers are more likely to make a change during this time of year. This is also a perfect time to complete those necessary home improvement projects that will help to ensure you receive top dollar for your home! And even if you are not planning on moving, this is a great time to get organized, clear clutter and give your home a face lift inside and out. Creating space in your mind and time in your life for the things that matter starts with clearing space in your home. Clutter can negatively impact your peace of mind because it causes stress and a lot of extra work: it’s a constant reminder that you need to get something done, organized or cleaned up. The key to avoiding clutter is for everything in a house to have a home. The dining room table or the bedroom accent chair is no longer the dumping ground for everything from bags to coats, scarves to books. Instead, taking time to make sure that each and every possession has a ‘home’ and getting in the habit of putting things away RIGHT AWAY, will help you unclutter your mind too. The ideal time to undertake this kind of project is when you’re planning a move. Whether moving up to a bigger space, or downsizing to a smaller home, the weeks before your move are the opportunity you need to start on the right foot, in your new home. As you go through all of your stuff to pack it in boxes, decide if you really need some of it. This doesn’t just apply to clothes and shoes, by the way. It’s valid for every item in your home. Do you use it? Have you used it in the last year? Very often, people hold onto things they don’t need because their heart tells them too. The skirt you wore all the time in your last year of high school but hasn’t fit in the last decade? Time to let it go. The rubber boots that you used for gardening that have a hole in the heel? Bye bye. Plan for storage outside of your home if there are things you can’t part with yet, and make sure those boxes are labeled as such, so they get moved to the storage facility as soon as possible. Take a look at what’s left, after the purging. You should literally count the numbers of pairs of shoes, handbags, suits, dresses, etc. that are going into your future clothes closet, so that you have a sense of how much of it there really is. If every suit is 1.5” of space hanging on a rod, you need to know roughly how much rod you’re going to need to accommodate your suits, without packing them in too tightly. If you didn’t do it during the buying process, see if you can get a last visit to your new home in the weeks before you move in so that you can measure. 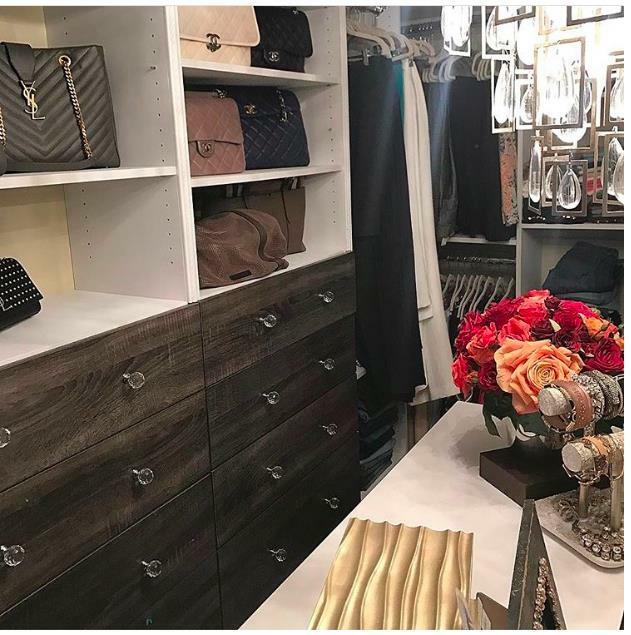 People always think to measure for window coverings, but this is an ideal time to measure your closet and storage spaces so that you can pre-order your custom closet design in advance of the move. That way, when you arrive and before you unpack certain boxes, you can set up the easy to install systems and have it ready to receive all of your things. 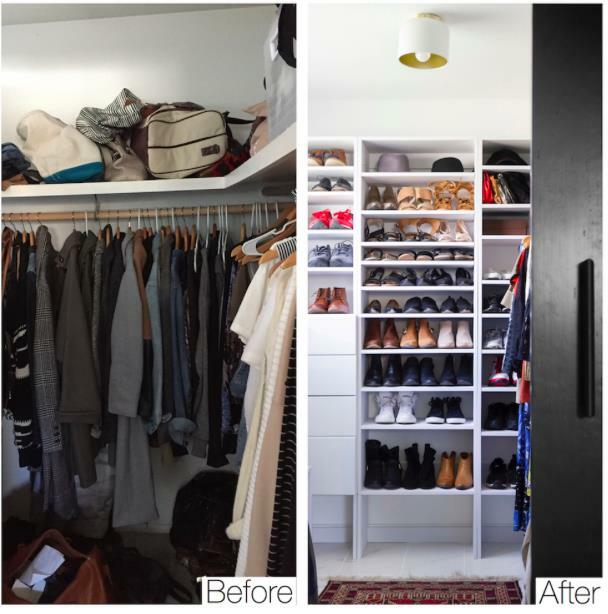 Make sure that everyone has a closet setup that they can reach! Kids need bars at their level, for example, and drawers they can reach without climbing on anything, and risking hurting themselves. They can start good habits from day one by knowing where to put their knapsacks and jackets after school, instead of throwing them on the floor or on a footstool. Clothes closets aren’t the only areas to measure, either. Check for storage spaces in entryways, basements, other rooms, garage or even the space under the stairs. Previously unused ‘dead spaces’ can be turned into valuable storage. See what space you’ll have and take detailed measurements of it all! Do it yourself modular closet systems are easy to order and install yourself, while you’re doing other things in the week you move in, like that fresh coat of paint. When all of your belongings have a home, and everything is stored away as it should be, you can take a deep breath and enjoy your home a lot more, from day one! https://www.modularclosets.com or on social media: Facebook, Twitter, Instagram, YouTube.